An updated article in Huff - but what a skewed thing. He's the victim in all this. Again the family knew he was sick ansd also knew he had guns. He's collecting on disability and "going to work"? The Carson City sheriff's office detailed the deterioration of his mental state and the law enforcement agency's handling of the Sept. 6 chaos following 85 seconds of terror that left five dead - including three National Guard members - seven injured and a community traumatized. He immersed himself in the Bible, and gave his mother keys to his gun safe, warning her he was "getting sick." It always comes out in the wash...that most of the people who have committed crimes like this have been on psychotropic drugs! Of course many Americans have a short attention spans, so if the follow-up isn't within a few days, after the fact, no one remembers the event. â€œItâ€™s important for this community to move forward,â€� the governor said, and credited IHOP for paying employees for more than 14 weeks while the restaurant was closed. Florence Donovan-Gunderson, a 67-year-old resident of South Lake Tahoe, was killed while eating with her husband, Wally. Sencion then shot at five Nevada National Guard members sitting in a booth. Sgt. 1st Class Miranda McElhiney, 31; Sgt. 1st Class Christian Riege, 38; and Major Heath Kelly, 35, were killed. Minutes later, Sencion â€” who had been diagnosed with paranoid schizophrenia in 1999 â€” fatally shot himself in the head. "what about the shooter and i heard on the scanner there were possibly more than one"
But for a time, authorities thought there was a second gunman on the loose within two miles of the state capitol building and the state DMV headquarters where hundreds of employees and customers were gathered. Now why exactly did they think this? Based on witness reports? Warnings by police? They are just not giving us the full story. Here's a thought. Maybe there was no second suspect. Maybe there were just a few fake anonymous 'reports' of someone running around with a gun. Just like the screens of the air traffic controllers were filled with fake hijacked aircraft on 9/11 because of the various 'drills' they were running that day. This would of course have diverted police first responders on a wild goose chase, allowing the shooter at the IHOP to operate with a freer hand. Art Panchal runs a South Lake Tahoe motel near the small Mexican market where Sencion worked, which is owned by Sencion's family. Panchal visits the market to buy jalapenos, tortillas and fish, and saw Sencion on those shopping trips. "He was a happy guy. He was always smiling," Panchal said. "He would help people out." 32-year-old Eduardo Sencion worked at his familyâ€™s business, a market, in South Lake Tahoe. Officers say he then went to the IHOP around 9 a.m. Tuesday in his brothersâ€™ van and started shooting. The market is owned by Sencionâ€™s brothers. FOX40 found a hand-written note in the window of the store stating they would be closed on Wednesday. Is this family here just for the time that they give the go signal to break out the AK's and kill us all? Crazed gunman murders four before killing himself. In an initial phone call by the Reno Gazette-Journal to the Lake Tahoe Mi Pueblo Market on Tuesday, a man claiming to be Eduardo Sencion answered the phone and said he didn't know anything about a shooting and wasn't aware of anyone having the same name. But in a follow-up call after a reporter verified Eduardo Sencion's address and employer, the man at the Tahoe market identified himself as Gilberto Sencion Gonzalez, 46. He said he was Eduardo Sencion's elder brother and admitted knowing about the shootings. 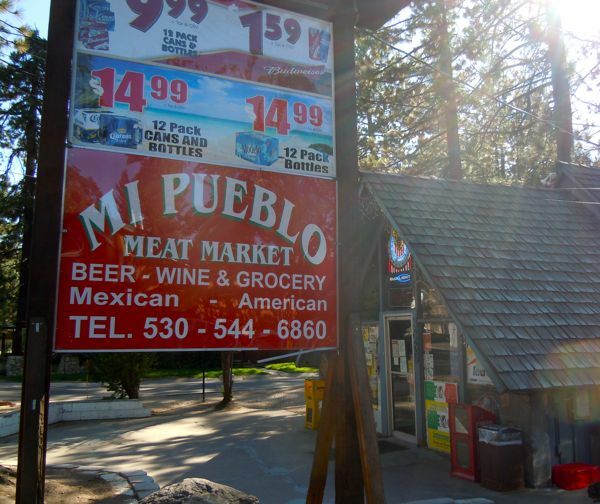 Gilberto Sencion said he arrived in South Lake Tahoe from Sacramento on Tuesday afternoon to find the Mi Pueblo Market closed. He said he had just found out about his relative's rampage. "I feel very sorry about what happened," he said. "I feel very sorry about those people. I'm trying to find out what happened. How would you feel if your mom or your dad did this thing?" Gilberto Sencion said he expected more media calls. "You guys (the media) are going to make a lot of money from this," he said. "In order for me to give you more information, you will have to pay me a lot of money, too." He declined to say anything further. Thatâ€™s kind of weird, isnâ€™t it? This guy gets a phone call from a big regional paper shortly after his younger brother goes on a killing spree, and initially tries identifying himself as his dead brother, only latter admitting his true identityâ€¦ before demanding the paper pay him for further information? I suspect a few twists in the Eduardo Sencion story still lie ahead. The bloodbath that had the local sheriff making comparisons to 9/11 is what happens in Mexico every single day, thanks to your government's criminal actions, actions that they are still desperately trying to cover-up. The rifle used in the shooting was manufactured by Norinco and has not been imported into the United States since the early 1990s, but they are still commonly found on the market. The Romarm Cugir found in his vehicle is the most popular weapon smuggled to the Sinaloa cartel under the protection of the federal law enforcement agencies involved in Operation Fast and Furious, and is commonly imported as the Century Arms WASR-10. We do not know why Eduardo Sencion went on his rampage. All we know is that he had a history of mental illness, and was armed with the same weapons our government purposefully sent by the trunkload to murdering narco-terrorists. From the RGJ: The partnership papers for the Mi Pueblo Markets LLC list Eduardo Sencion as the registered agent for the company and Gilberto Sencion Gonzalez and Israel Sencion Gonzalez as managing partners. The business has locations in South Lake Tahoe and Stead. Bump for migrating gangs to El Norte ..
CARSON CITY, Nev. ? A man who stormed into a Carson City IHOP restaurant with an assault rifle was diagnosed with paranoid schizophrenia as a teenager and feared demons were after him in the months before he killed four people before ending his own life, according to newly released police information. Sencion's medications were changed this summer. About a month later, he approached a priest in the street and asked him for help, telling the priest, "They're telling me to do bad things." The night before the shootings, Sencion, who lived with family members, took his medication at 10 p.m. Everything appeared normal the next morning. His last comment to his family ? "I should have gone to work today." Sencion then began shooting at five Nevada National Guard members sitting in a booth. Sgt. 1st Class Miranda McElhiney, 31; Sgt. 1st Class Christian Riege, 38; and Major Heath Kelly, 35, were killed. Their comrades ? Sgt. 1st Class Jeremiah Mock, 32, and Sgt. Cait Kelley, 25, were wounded.